Soldier: I am going to ignore her, she doesn't know what she is talking about. Me: Ok, but we are gonna get lost, hopelessly lost. Soldier: No we aren't, I know where we are. has made me more patient? Soldier: Really? Maybe I should learn to knit. We did get lost, and I estimate I got an extra 20 minutes of uninterupted knitting done, and then we spent too much money at Ikea. All around a great day! 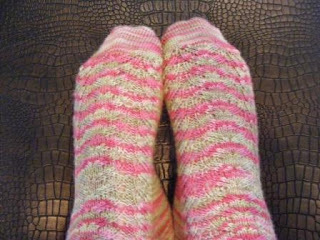 I have been working away on the second pair of socks for February. However I am only up to the gusset increases. I have been somewhat distracted by the Twilight series. I finished the fourth and last book last night and now I have one less distraction standing between me and a finished pair of Little Witches! I must learn to knit and read at the same time. The Pablos are done. I am really happy with them and they actually fit. It was a very easy pattern to follow, with a six row pattern repeat. I followed the pattern for the foot, substituting a short row toe, until after I had turned the heel and knit the heel flap. I then had to increase to 72 stitches to get the sock up over my heel. 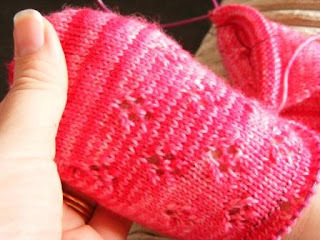 I think that if I had added extra length to the heel flap I may not have had to increase the stitches. It is still a tight fit over my heel and I do have tug quite a bit to get them on. Saying all of that I am still happy with how they fit once they are on. I really love the heel. 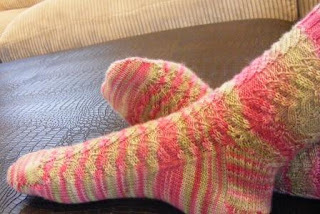 There are increases for the gusset and then the heel is turned on half of the stitches in the center and the heel flap is knit at the same time as 'picking up' the rest of the stitches from either side of the heel, by knitting or purling two stitches together. So there are no stitches to be picked up and you still get the look of a heel flap. These are my first toe-up socks and I think they may be the way to go from now on. I used Elizabeth Zimmermann's Sewn Cast Off and it worked out great. Really stretchy. I was cutting it a little fine with the amount of yarn that was left over after I had finished it, and it was a little hard to weave in the ends, but I managed. They are currently having a good long bath in some wool wash because the yarn is a little scratchy. I am hoping it will soften after the wash.
My thoughts go out to all those who have lost family members and property in the devastating bushfires in Victoria and New South Wales and to those who are still wading through flood waters in their homes in North Queensland. Also I am very thankful for the tireless efforts of the CFA and SES volunteers. They do great work and we can always depend on their hard work and support. I haven't made a lot of progress on the Pablo's in the last few days. 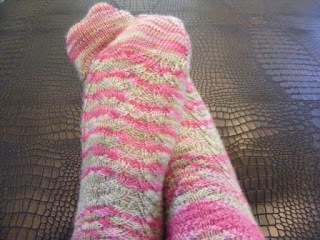 I have turned the heels, and completed two more repeats. That may sound like a lot, but each repeat is only six rounds. the socks are very tight over the heel and I don't know how to fix it. So I am waiting on the 20 degree drop in temperature that is due here on Monday to rip it back and try again. That is after I do some research on just how to fix it. So it is the first of the month. That means my very first shipment from my personal sock club. As I said yesterday I am one month behind on my plan to knit twelve pairs of socks this year, so this month I will be finishing the Pablos and starting a pair of Socks for Little Witches for Noo. 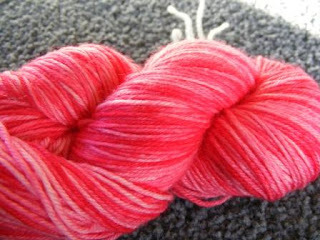 I will be using the yarn I dyed the other day with food colouring. I am calling it Pink Lemonade. It was the first skein I dyed. As I was a little skeptical that it would actually work, I tried it out on a 50g skein, so that I didn't feel like I had wasted a lot of yarn. The 50g skein is perfect for my little one. I will spend today working on the Pablos and reworking the pattern for the Witches Socks. I am going to rewrite it so that I can work it toe up and so that it will fit Noo. The pattern is written for five to seven year olds, Noo is a small three year old. I haven't done a lot of reworking of patterns before so this will be a challenge.